Developed by Z-Axis (a very talented crew that brought us the excellent extreme classics, Aggressive Inline and Thrasher: Skate and Destroy), X-Men lacks the polish and depth that the crew's previous software has always had. At its best, this film prequel is a limited and straightforward beat 'em up that benefits from a touch of sky surfing and a smaller dose of smoke and mirrors. It's a hard pill to swallow to say the least, and especially so when coming off the memories of the addictive X-Men Legends franchise and Z-Axis' past history. To its credit, X-Men: The Official Game does try to mix it up. The three playable characters are certainly different in how they operate and none of the three feel like carbon copies of each other. Wolverine, for example, is your basic scrapper complete with quick attacks, heavy blows, and a fury mode, while the teenaged Iceman is a blown-up surfer -- a guy that soars through the air on a pathway of ice who can also fire various kinds of frozen projectiles at enemies. 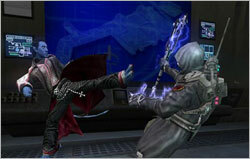 The most entertaining character to use, however, is "the Amazing Nightcrawler". A highly-acrobatic weirdo that can "Bamph" from one point to another (aka teleport), the little blue devil offers a nice mix of quick fisticuffs, limited platforming, and speedy twitch challenges. But the problem with these guys isn't their diversity from one another; it's their diversity of options within their own arsenal. The hairy badass Logan, for instance, never really offers anything beyond a few easily repeatable combos and he has actually taken a step backward from the abilities in 2003's Wolverine's Revenge. This kind of simplistic combat applies to Iceman as well. The young mister Drake can only shoot frozen beams or utilize a missile-like Hailstorm attack while occasionally needing to summon an ice shield for protection. That's pretty much all these guys do -- and it gets repetitive quickly. Making things even worse is the fact that a broader move set isn't even needed. Enemy AI is downright brainless and doesn't offer much beyond a tendency to defend everything with little response on the hard difficulty setting. When opponents do attack, though, they usually follow the same one to three-hit combo that all their palette-swapped buddies do -- making them easy targets for whatever punishment your mutant team wants to dish out. It isn't all bad, though, as there are a couple of cool moments that really make playing through X-Men more tolerable than the battle engine would lead you to believe. Nightcrawler in particular should have had a title of his own, as his ability to maneuver via teleportation to inaccessible areas makes the game's otherwise boring and unimaginative level design interesting. The fact that Crawler can incorporate his teleports into combat as well makes his hand-to-hand confrontations the most fun too, and the fact that we learn his reason for not appearing in X3 is a nice, if not short, little surprise (the game is set between the last movie and the upcoming sequel due out next week, after all). Another nice little plus for X-Men is that its boss battles are actually fun. 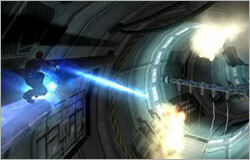 Iceman's battles against Pyro, Wolverine's confrontation with a bossy Sentinel head, and a number of other special end-level sequences are usually worth their salt. Speaking of Iceman, his sky surfing sequences can actually be somewhat fun too, you just have to forget about the insipid arbitrary combat and the bothersome time limits imposed on him in almost every stage. Then again, that sort of qualifier is a microcosm for the type of experiences that X-Men: The Official Game brings to the table -- little bits of fun buried beneath mounds and mounds of repetition and unnecessary blandness. If you're a fan of extras, at least the game does offer a decent selection of them. Hidden collectables (which are only difficult to locate on the Iceman stages thanks to those aforementioned time limits) and unlockable costumes and Danger Room missions add a bit of replayability to the equation if you're looking for it. The incentive to play through multiple times to uncover all the story trees and character upgrades (extra health, extra damage, etc) are nice to have too, but there isn't much to write home about other than that. Unfortunately, the same could be said about X-Men's presentation as well. Usually one of the strongest elements of Activision's Marvel videogames, the production values in X-Men is far below the norm. Voice-acted scenes don't push the envelope despite Patrick Stewart's familiar tone, and the graphic novel-style cutscenes seem a bit dated for today's in-game and CG-driven narratives. The music seems to have a mind of its own too (it'll shut off abruptly and start up again just as quickly), and the visuals don't offer anything that we haven't seen in a million action games before. It's frustrating to think how good X-Men: The Official Game could have actually been. It has a great license, a strong developer, and a ton of momentum behind it thanks to the imminent release of The Last Stand later this month. But for some unexplainable reason, none of these qualities were ever taken advantage of. The combat and stage design are substandard in every way, enemy AI is ordinary coin-op fare, and the presentation elements are nowhere near the level we've come to expect from Marvel or Activision. I'm just thankful that a good portion of the boss battles are fun to participate in and that Nightcrawler is a nice distraction from the rest of it. But in the end, Kurt Wagner and the big bads just aren't enough to save it.